With the weather being so on and off, this breezy top has been another of my go-to pieces since it works with both jeans and shorts. This was during a cooler day, but lately it's been mostly cutoffs. One of my go-tricks when I'm having a crazy hair day is to wrap my hair in a silk scarf. Especially in the summertime when it gets too hot to wear a hat (like here). I personally think that turban headwear is totally underrated. What do you think? So cute! I have yet to try the turban but I think I will have to! You were the reason I took the plunge with Hats - which I love and try not to wear Everyday! Such a great top on those 70 degree days that start out 40! Obsessed with this look! I need that turban!! So cute!!! You pull this off so well! Love that necklace too! Love the turban on you! Yes, I think you can wear a turban whether or not you are having a bad hair day, and with your coordinating accessories you look fabu! You're totally rockin the turban! You pull it off so well! Hello, scarf and necklace combination!!!! FAB! I love this look. Gorgeous! Turbans are always a good idea! 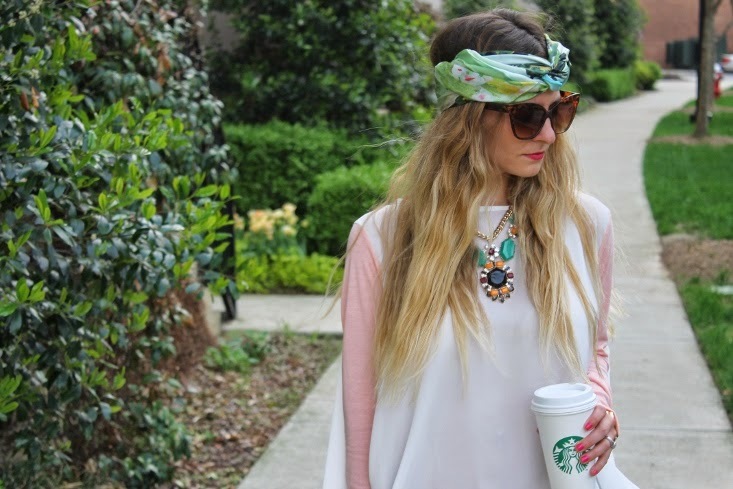 Love the turban look! I haven't worn one in forever, you are reminding me to revisit it! Love this girl. I am also in love with that necklace from FABB. Hope to see you soon! Love the necklace! Great statement piece!